If you list out the top 3 hill stations in India, Shimla will definitely come in the list. With its heavenly beautiful views, mountains Shimla has become one of the most loved tourist spots in this country. Over 8 lakh population and more than 15 different types of religion followers (Almost 85% people of Shimla are Hindus) Shimla is doing pretty great. Christ church shimla is an old Church in Shimla. In this article, we will learn about the most popular church in the Shimla district. Though the percentage of the Christian community in this district of Himachal Pradesh is very low (approximately 0.25%) still Shimla has a good amount of Christian church and few are very famous as well, thanks to the religious beauty of our country where every religion gets equal respect irrespective of their follower’s volume. Shimla is not only famous for its weather and hills but also for different man-made places too. Few temples, churches are also very popular for demonstrating and reflecting the culture of the place and religion. And as I mentioned earlier, today we will take a look at one of the most popular churches of Shimla, the Christ church (Shimla). The below piece of writing will be very helpful for those planning to visit Shimla’s Christ church. So, let’s dive deep into this historic place. Have you heard about St. John’s Church? Yes, situated in Meerut, also known as the oldest church in the North. Shimla’s Christ church has been recorded as the North’s second oldest church, after St John’s church. Christ Church Shimla history dates back to 1857. Christ church is located on the Ridge, Shimla. In 1857 the British have built this church in the NEO-GOTHIC style. Well, I must say, the British had chosen the perfect place for this church, one can see for kilometers around the city. It bears a mind-blowing historic memory of the British Era in this country, I am just talking about the beauty of this Church. The design and creativity came from Col. J T Boileau in the year of 1844. In took more than a decade to give the church it’s designed to look but if you visit this place, you will surely admit that the invested time is surely worth the beauty of the church. And, not only they have invested time but also a huge amount of money. It took almost 45,000 to 55,000 Indian rupees of that time to complete the creation of the church. At the partition period of the 20th century, this church survived somehow and got included in India. In the year of 1948, Rev. B. S. Chander was appointed as the first Indian Chaplain of the church. He worked there almost 9 years, till 1957. Thanks to the Indian Government for providing perfect maintenance time to time. The Christ Church still holding and demonstrating the large history in an amazing way. The british was really proud of the christ church shimla architecture. Though it is the story of long 180 years back the British didn’t lack any modernity in the architecture, perfectly designed in the NEO-GOTHIC style. The design and creativity came from Col. J T Boileau which has been appreciated by thousands of people. The five stained glassed window of the church reflects Christian values of charity, faith, hope, fortitude, humility, and patience. In the year of 1899, the pipe-organ of the church was installed which is the biggest one in the country. If you do a little bit of research, you will know the best for visiting Shimla in January. With the New Year’s fresh air, the mountains and lands covered with thick white layers of ice reflect nothing less than a heavenly view. 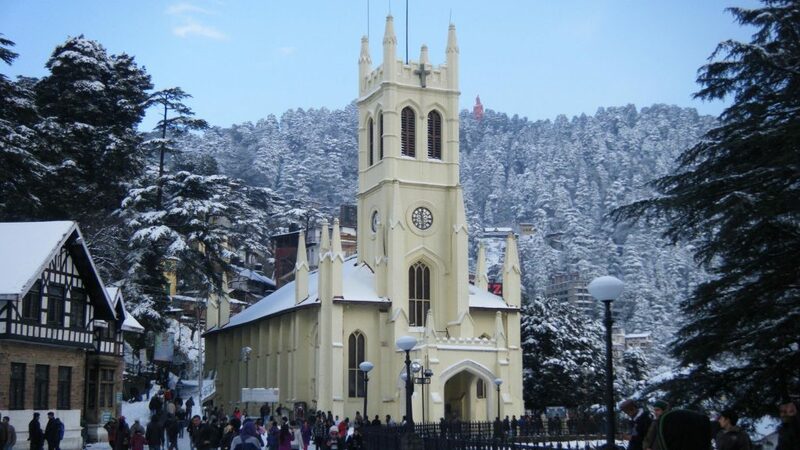 Christ Church shimla in january will be fully covered in thick white snow. From trees to mountains, lands to roofs every bit of the district is covered with those beautiful white ices and sometimes snowfall adds a bonus beauty to the scenario. I have visited Shimla twice and it really feels god has shaped every inch of this place with his own hands. And if you talk about the church, I am sure even if you are not a religious person still you will fall in love with the view, especially in the night time when the white layer will mix itself with the church’s colorful light. Oh! How much I love this place. I will surely recommend you to visit Shimla in the month of January. Though Shimla is a hilly place but lacks no modernity. The transport and communication system is very good which is an advantage for all the tourists. You can find a long list of hotels according to your budget and need. Below we are mentioning few hotels you can book if you are willing to stay near Christ church, Shimla. Hotel Shingar: It is a three-star hotel with TV rooms, parking, restaurant and other facilities. The Room price may vary according to the session. The average price is 1600 INR per night. If you want to enjoy a hill sight, this one will be perfect. Mahamaya: Another 3-star hotel costing average 2400+. Their service is quite good and the place is surely recommendable. Crystal Palace Hotel: A down to earth three-star hotel with good rooms and suits. The service as well. It will cost 2400 INR in average per night. Hotel White: Costing very low, average 1100+, hotel white is another good place to spend your holiday. Hotel Combermere: A 4-star hotel with very good rooms and services. This hotel is a high ranged hotel charging average 7000 per night. The price is worth the place, so you don’t have to think second time if you are choosing this hotel to stay. Hope you have been provided with a satisfying blog tour of the Christ church Shimla. I will highly recommend you to visit this place. Hope you are left with no doubts regarding this, if there are still any, you can comment below. We will definitely get back to you.